Plying balls are made of win. | carpe diem! Plying balls are made of win. Well, actually they’re made of singles and win. Simultaneously. Isn’t that clever? They are clever. I learned of them from Abby Franquemont and, just after Christmas 2008, when I decided I could not spin another millimetre on my Victoria, I wound the singles I’d created so far for a 2-ply project off the Louet bobbins into plying balls with the intention of trying the technique. 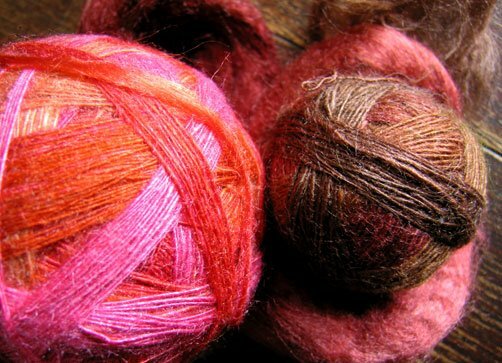 That’s Treenways Silks tussah silk in ‘Sunset Swing’ (left) and ‘Musgrave Medley’ (right and roving). Wind the balls very, very tightly – these are like those elastic-wound golfball centres, they bounce – because it’s essential to control the twist in the singles. That picture also explains the project. I passionately hate pink, but I’ve gradually begun to realise it actually does things for me when combined with bronze and orange. I think that ball on the left is gorgeous (you should have seen the roving) but I’d never wear it. Never, ever, ever. 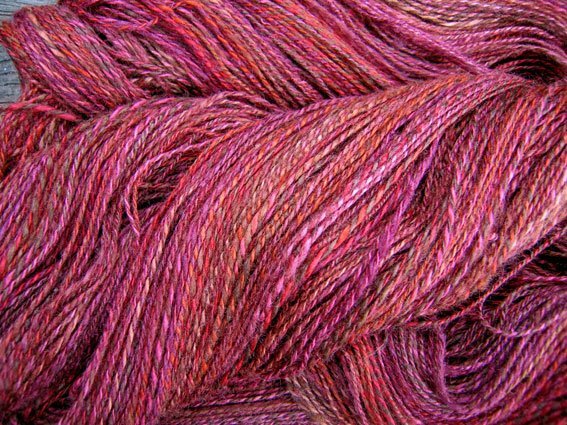 I had the notion that if those brilliant, bright colours were plied with similar but much darker colours, the end result would be toned down to the point that I could bear to look at them in sunlight. And maybe even wear them. There’s my setup for using them. Looking down from my chair, you can see two ceramic bowls (the handles are important), one for each ball, and the singles running to the wheel. A closer shot shows the singles running from the ball UNDER the handle and away to the wheel. 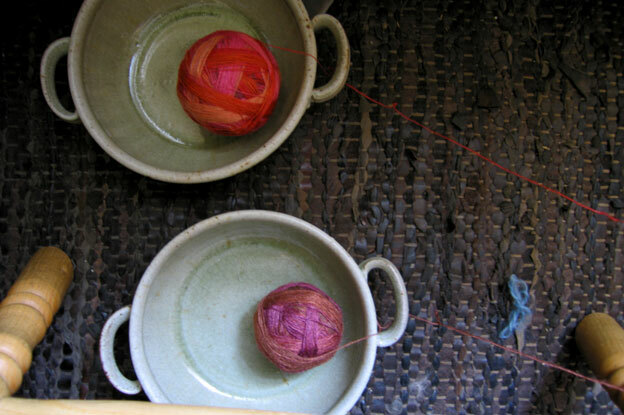 Under the handle is good because it stops me pulling the balls out of the bowls: the plying balls just sit nicely, each in its bowl, rotating to feed an otherwise very temperamental lively single to my left hand. Despite Pshop, these photos does not do it justice. In sunlight that skein GLOWS. 460-odd metres of every shade of warm from the dying embers of a woodfire to the most beautiful sunset you’ve ever seen. I love it, and I love it even more because my guess was right and it’s taught me something. I want to wear it. Last weekend was hectic. On Saturday we walked (3 hour drive each way); on Sunday I put both the Schacht Matchless and the Suzie Pro in the back seat of his car and carefully fastened their seatbelts (he said it looked as though I was taking my children out) and drove (an hour and a half) to Socktopus for Diane Mulholland’s ‘Spin Short’ class. Well worth the drive, both for Alice’s shop (full of beautiful, colourful, desirable sock and lace yarns) and to meet Diane, who is a very good teacher indeed. We started with fine merino to learn spinning from the fold, something that has previously eluded me, moving on to camel down (soft!) and cashmere (unbelievably soft!) spun from the fold and long-draw from the end of the top. From left merino, camel, cashmere (the palest tan). 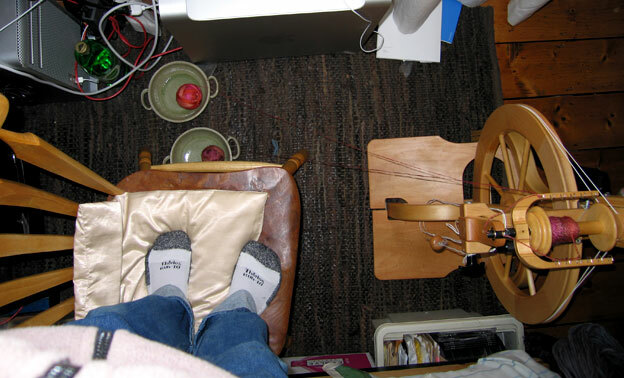 We spun on featherweight spindles and on wheels; I started on the Schacht with the silly fast whorl (one size up from the tiny stupid fast whorl) while Diane used the SuzieP with the extra-fast whorl, then we swapped so she could try the Schacht. And then we moved to cotton. Wow. Just… wow. 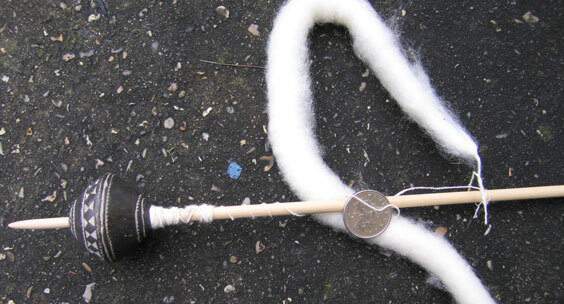 I am glad I had someone to tell me everyone who thinks they can spin will have problems when they first try cotton. It’s not like other fibres. Try for Beginner’s Mind. The fibres are short (we started with long cotton because the short-staple stuff is just ridiculous) and they tend to stick to each other: drafting requires both a knack and some effort. Nonetheless it is strangely compelling. Perhaps it’s the challenge? That’s the ‘easy’ long staple, spun from my own punis(!) 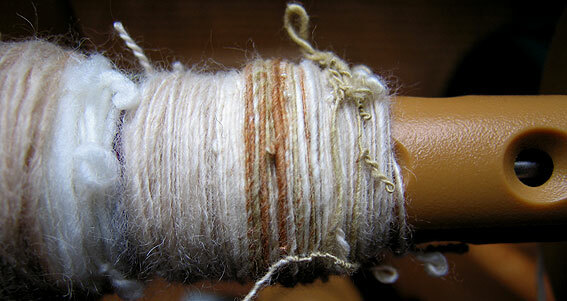 followed by some sliver in natural colours, brown, cream and greenish. The class was such fun and Socktopus is such a delightful place (pretty cupcakes, cheerful Sunday knitters) that I will be back. I’ll find a reason. The drive home had added interest: the M25 Northbound was closed at J17. I left for the M40 at J16, left that at the first opportunity, and joined the horde of motorists flooding across Berkshire. It was absolutely hilarious. Main roads were 5mph, nose-to-tail at with drivers blindly following the instructions from their GPS systems, faces lit with blue light from the screens. The small roads were were alive with people like me, working from roadmap atlases, diving into laybys or onto verges to flick the interior light on and work out what to do next before the light goes off and we peel out again into the darkness. I was an hour or so late getting home and I haven’t had that much fun for ages! Look what I accidentally bought when I got home. That’s a traditional Mali bead spindle for supported spinning of cotton from Amanda Hannaford which meant I spent Tuesday lunchtime playing with cotton again. 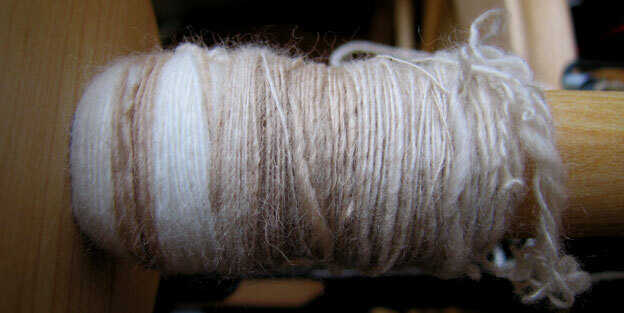 When I’ve spun enough I’ll try finishing some; I think it has to be tortured, boiled alive or something similar. I seem to remember washing soda might be involved. Lastly, a quick glimpse of some extremely slow knitting. 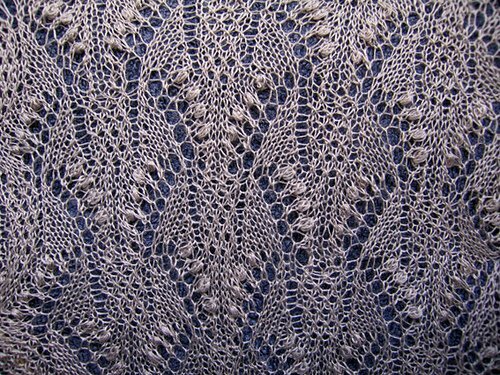 The Yarn Harlot recently posted about some issues with a shawl; this is the shawl that’s nearly defeated me. That will be (it will, I swear it) Sigga from Føroysk Bindingarmynstur/Faroese Knitting Patterns. How hard can it be? 601st cast on is a bit wearing, but with care and stitch markers every 25st, it’s bearable. 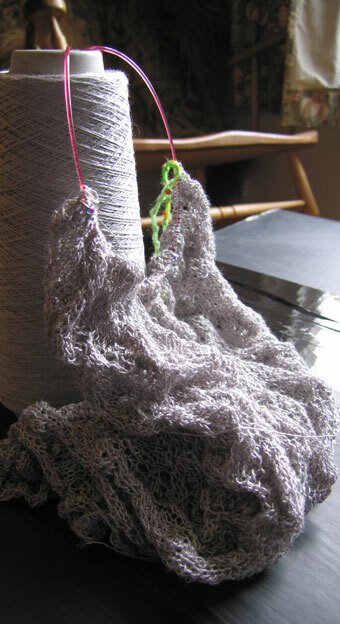 Then there’s a lot of knitting (not even any purling). I can do that. The decreases that drive the shaping? no problem. Lace insertion? Come on, YO k2tog or ssk. Where’s the prob… ah. Try running the decrease lines in the other direction, just to be different, don’t like the result, rip back 6 rows (that’s 6x almost 601st), pick up the live stitches and try again. Realise you somehow missed the bit in the instructions about the additional decreases for the first 30-odd rows, decide to wing a solution and carry on knitting. Realise you’ve messed up the YO/decrease pattern in the central panel and, on the next round, drop every one of 21 stitches back 6 rows and remake the decreases in a different direction with a crochet hook. Finish the lace, breathe a sigh of relief, charge ahead and realise you’ve forgotten the final YO/decrease row *and* 15 garter ridges after that. Grit teeth, rip out 5 rows, pick up live stitches, carry on. I am learning lessons here about patience, and thinking before jumping. And that it’s next-to-impossible to face ripping 2000-odd stitches when you’ve just finished knitting them. Easier to do it first thing in the morning, fast. A bit like ripping a band-aid off. 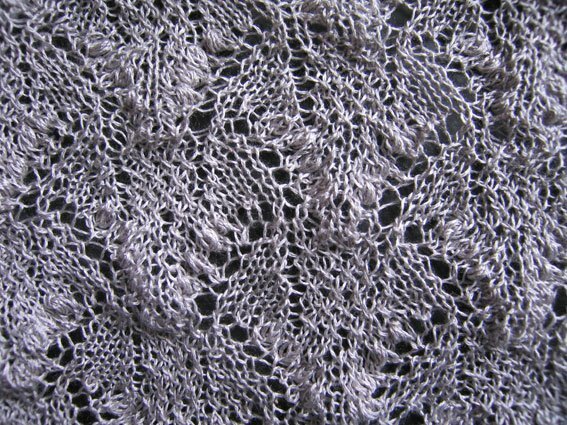 Here’s a lesson in slow-but-steady: my version of the Maikell Shawl from ‘Knitted Lace of Estonia‘. The cone is 2500m of loosely plied 2-ply silk from Colourmart, and the blob is about 8 repeats of the centre panel. 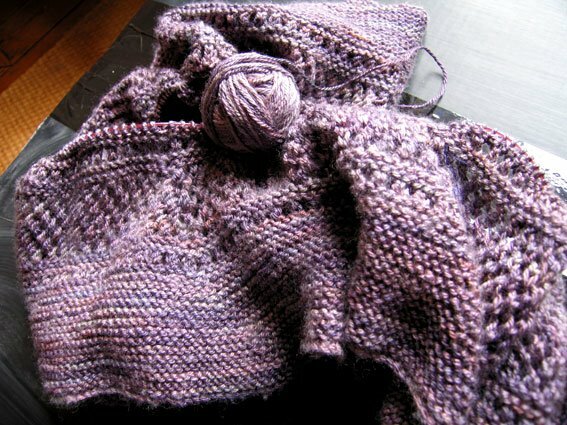 The pattern calls for 12, but I’m using smaller needles and finer yarn, so to get something of decent size I think I’ll need at least 15, perhaps 18. This is what it looks like laid flat. And this is pinned to show more detail. And the numerous nupps. This shawl is teaching me that choosing to knit 7-stitch nupps in fine, inelastic silk thread is NOT clever. Very not clever. But other knitting has taught me to persevere, so I shall. Just not tomorrow. Tomorrow is for walking! Which also teaches perseverance. A useful lesson to learn. This entry was posted in Uncategorized on February 28, 2009 by sarahw. the red/pink yarn is lovely! very soft tones. How is the Maikell going? Mine is blocking as I type. I also added some repeats to get a decent length, and they were very necessary. One of these days I’m going to have to make something in silk from Colourmart.